This ride is relatively far away for us (5.2 uphill miles) so we usually leave home early in the day and gradually meander our way to Loyal Heights via a park or toy store stop and lunch stop. 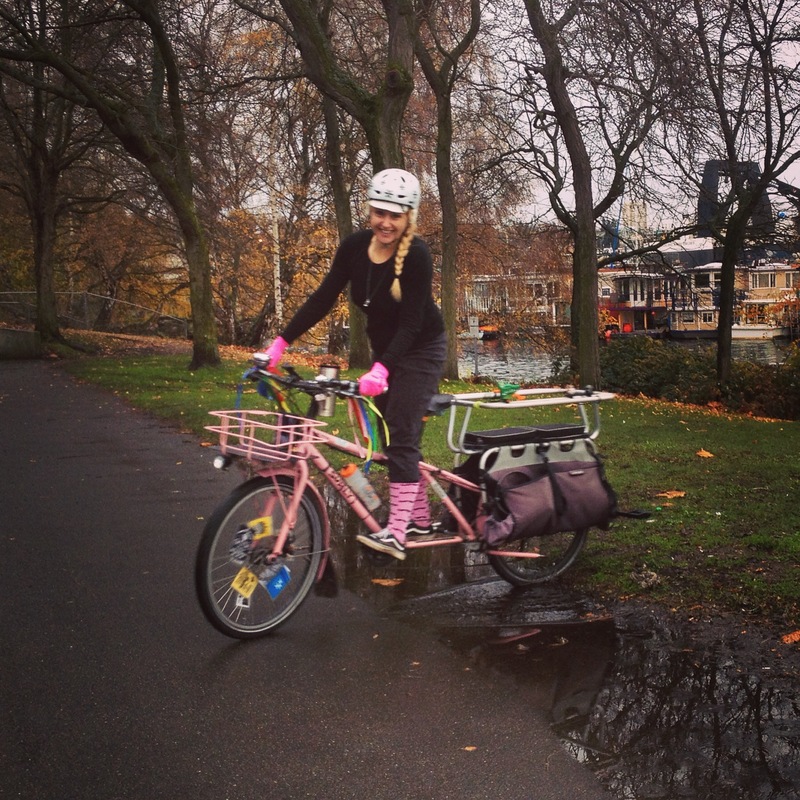 But given the all-morning rain, we holed up at home until the last moment this year. 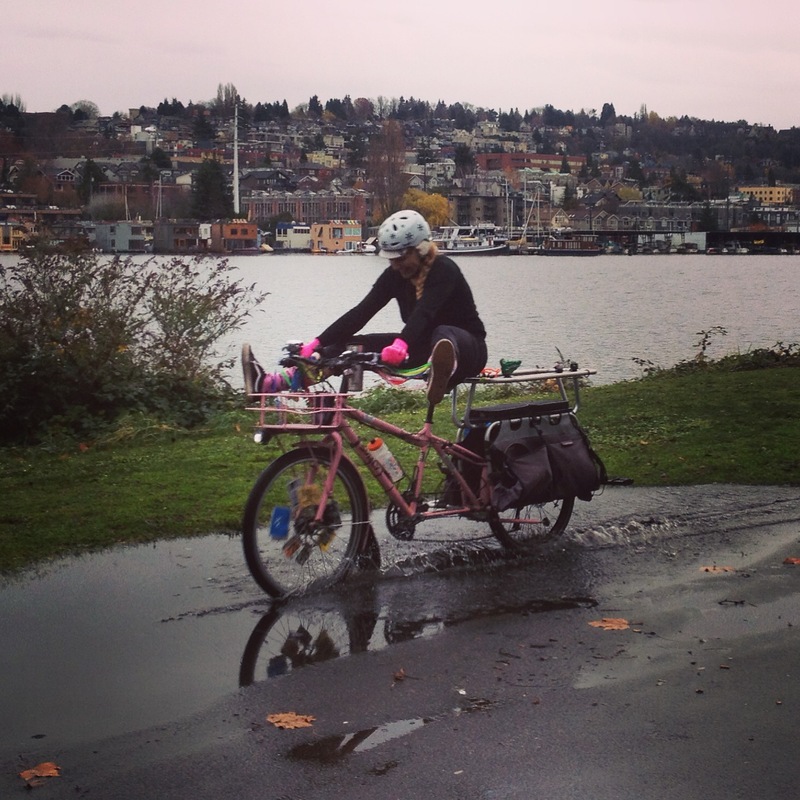 In addition to the fine tuning of our layers, I’m also still fine tuning our bike choices. And how wonderful to have choices! Usually. 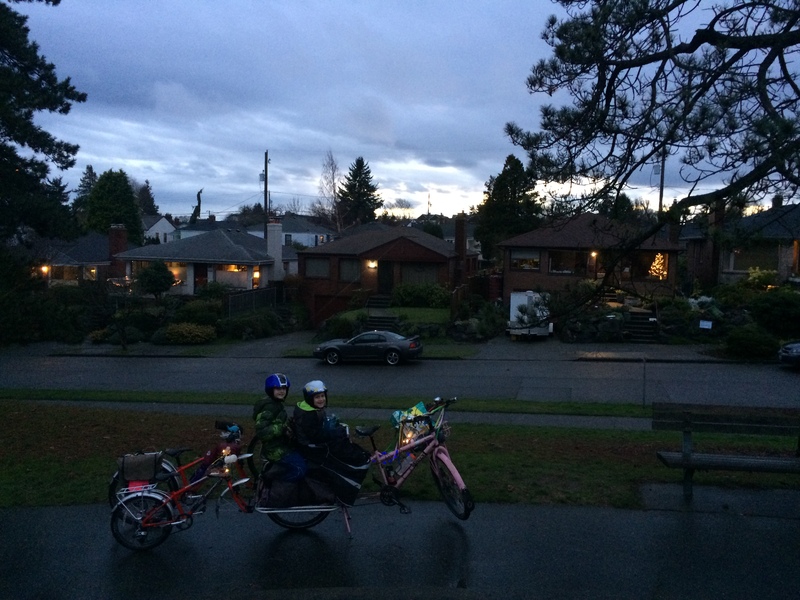 I love that the kids want to ride their own bikes more and more (I think. Usually. Because that means less hauling and less work for me.) 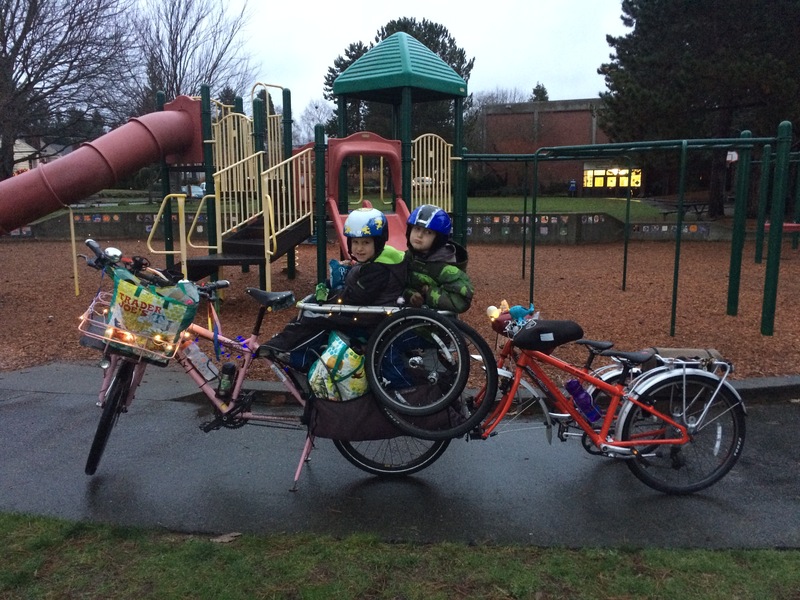 but I tried to suggest we ride the tandem plus trailer bike for this ride so the kids could do a bit of pedaling to keep warm while not having to be responsible for propelling themselves uphill on their own little bikes. 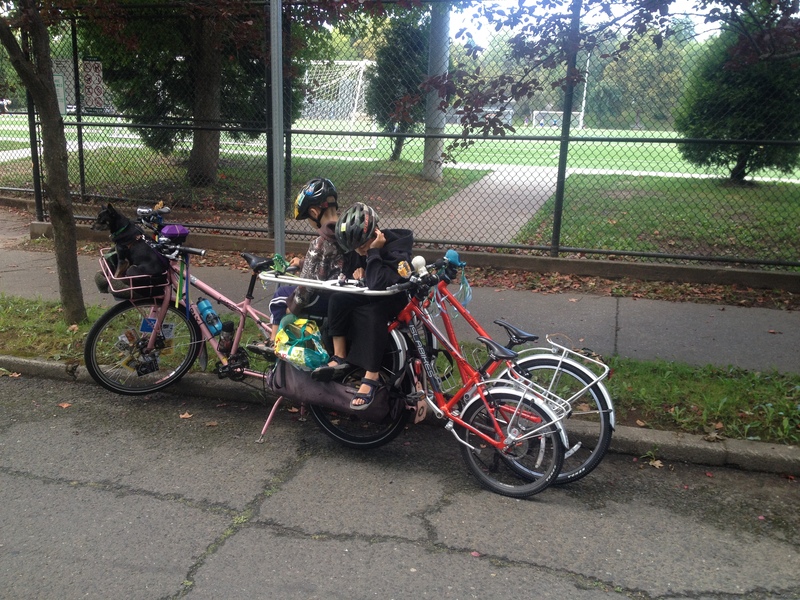 Last year thanks to a sick kid, I took the old mamabike and trailer and it worked great, but this year I conceded to their suggestion of riding separate bikes. We started out somewhat OK (but not quite OK) layers-wise. Both kids in rain pants for extra leg layer, little kid put on snow boots but decided they were uncomfortable (big kid still doesn’t have new, bigger snow boots) so they were both in tennis shoes, sweaters and snow jackets, snowboard helmets, balaclava only on small kid (but balaclava packed along for big kid), no one in snowboard goggles, it turns out they needed to see the number on their twist shifters so each kid had a handlebar mitten on the left handle, but thinner of our two glove options on the right hand (they can’t shift well in their thicker gloves, but I had them along for just-in-case later). Do they look like adorable little Fiddler crabs or what? And ohmigosh, I didn’t notice Pixie in the window when I took the picture! I told her she could come with originally, but then it was so cold and rainy I decided she should stay home and be comfy albeit lonely. My six-year old made it one block before he declared he was tired and I offered to carry him and his bike, which he quickly agreed to. My eight-year old made it half way. 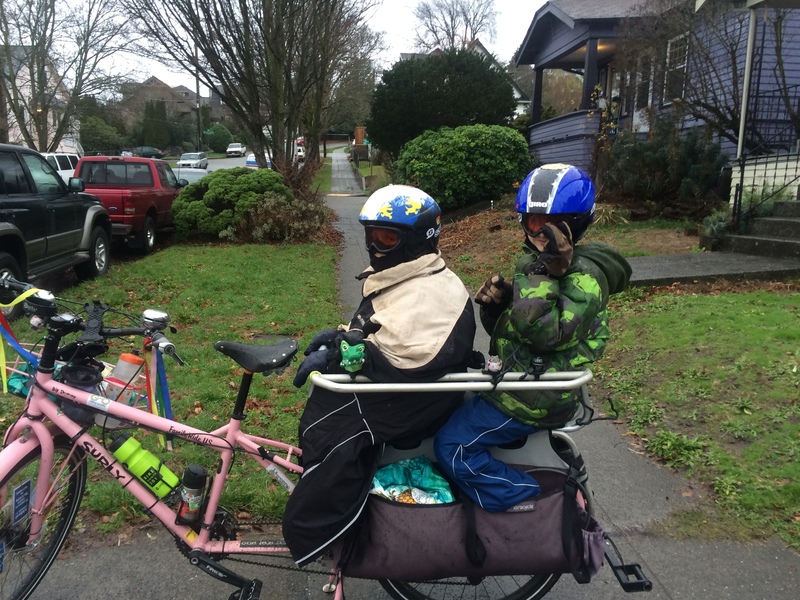 They both had frozen paws so we swapped thing gloves for thick and to deal with their frozen feet, I put my spare rain jacket on the six-year old as an apron to hang over his feet, and had the eight-year old tuck his feet into the Xtracycle FreeLoader bags. It seemed to do the trick. 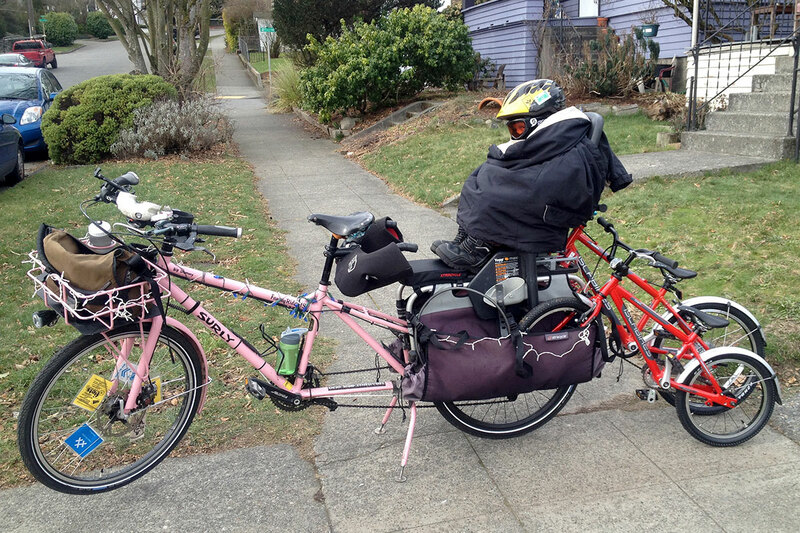 And of course there were quite a few mentions of “Next time I suggest we take the tandem, we’re going to take the tandem!” But the good thing was that I finally got to do a two-kid, two-bike haul with my new tow hitch! It worked great! And by the time we arrived to the start point, the rain had stopped and we even saw blue skies off to the west! However, I didn’t lash the front wheels to my Hooptie well enough and lost one during the course of the ride. Talk about embarrassing to hear “Watch out! Loose wheel!” and realize I’d loosed a wheel at my followers. Fortunately, no casualties and I was able to quickly retried the lost wheel. And that certainly will never happen again. 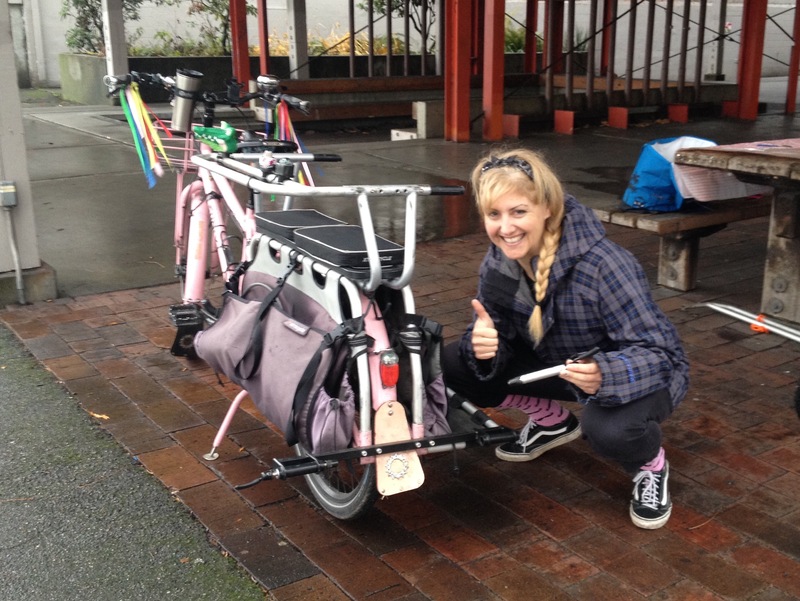 Still loving the Gear Ties, but I shouldn’t have tried to share my twinkle-light-holding Gear Tie with the 24″ wheel. 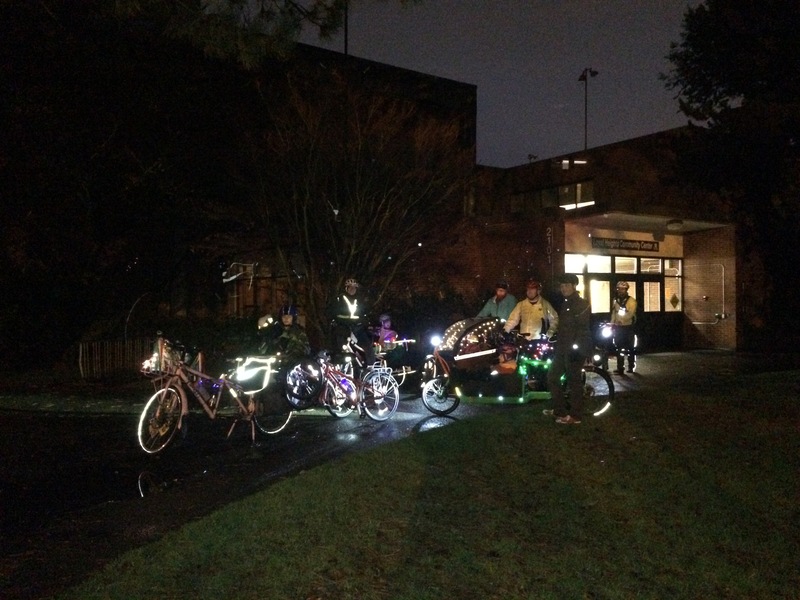 This was our first year holding this ride on a weekday and the Loyal Heights Community Center was open! So despite arriving 20 minutes late (“Meet up at 4pm so I can take pictures while there’s still some light and we’ll roll at 4:45”) we were the first there at 4:20. 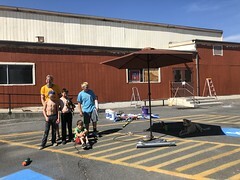 We stopped at the play structure, our usually meeting spot, which worked well since the day-long rain had finally stopped (yay! ), but soon migrated to the community center for warm lobby, train table, and Duplos. 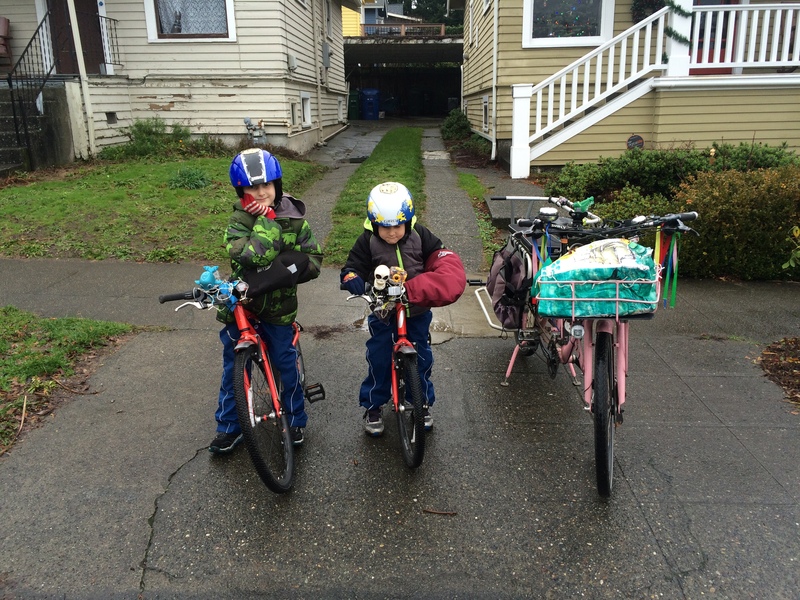 Our three-mile route worked well, and it was great to have cut out the last uphill block to busy 96th last year, though 95th still proved to be a steeper downhill than what we normally do for Kidical Mass. Note to self: test ride this route and see if it seems better for next year. The ride was awesome overall. 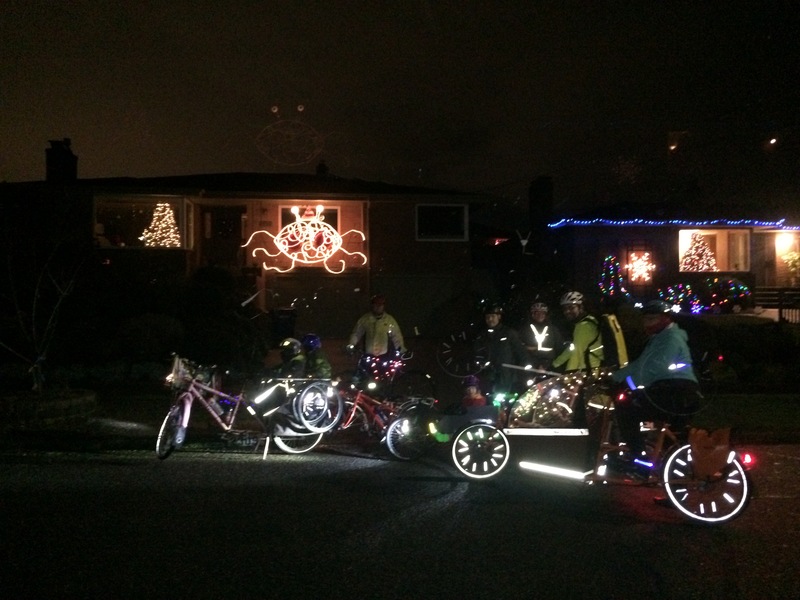 There wasn’t a lot of car traffic, but there were still a few people to shout “Happy holidays!” to. I stopped us to take a picture of this decorated van I don’t remember from years past. And the Flying Spaghetti Monster looked as good as always. 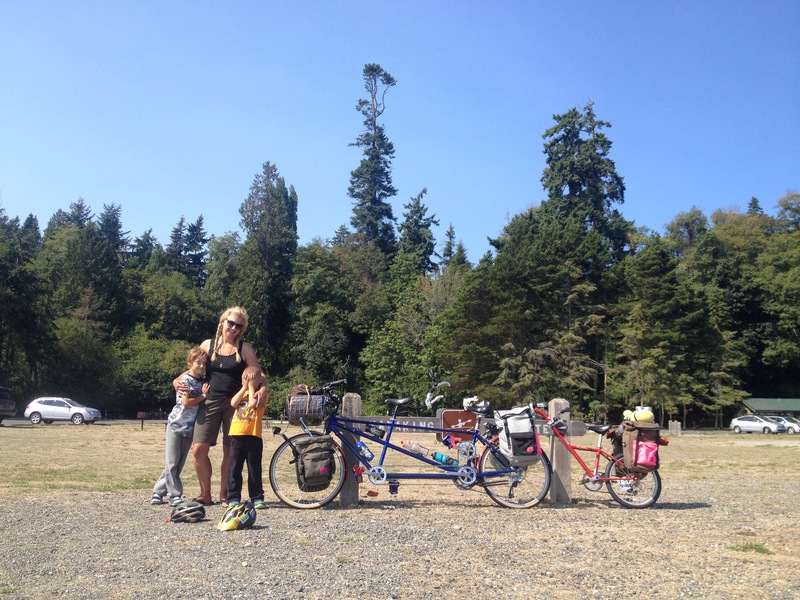 We lost a couple families who peeled off towards home before our stopping point (always OK!) at Grumpy D’s Coffeehouse, where we had treats and played with the many kid toys. 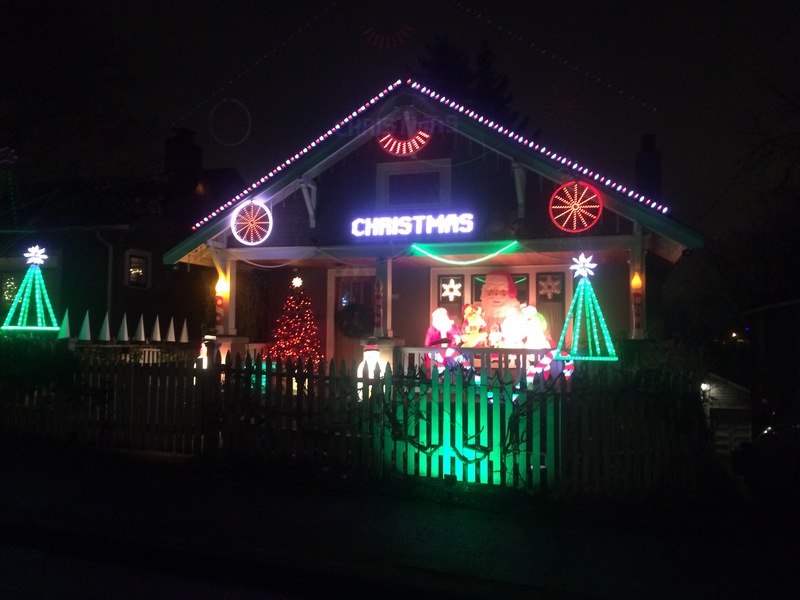 Heading home, we stopped by a friend’s house around the corner who has the second-best light display (second after the holiday house, currently still undecorated after the explosion). 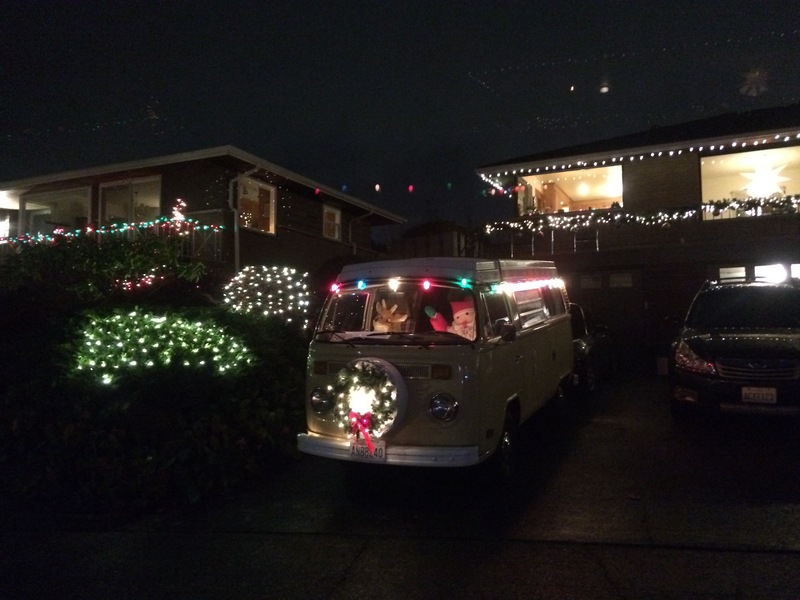 Our friend’s house gets more elaborate every year. The last two years the light-up Christmas trees tell jokes between songs. This year we heard: “What did one snowman say to the other snowman?” “Hey, do you smell carrots?” Ha ha ha! We live in the best neighborhood!